Our last day aboard the Queen. I slept well last night - finally getting used to the rhythms of the boat. In fact, I am awake before the 7am call of "GOOD MORNING - WAKEY, WAKEY." Rich seems to be feeling better right away this morning and says he might even try the first dive. Yeah! He's back! 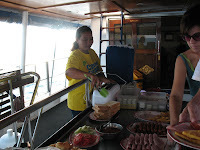 We head down for 1st breakfast and join Janel at our usual table for coffee and toast. 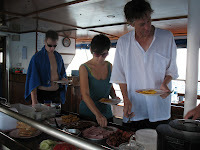 Since we will be diving at Koh Bon (a site we have already visited) there is no real briefing. 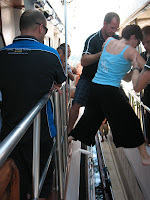 Kim asks us if we want to go deep instead of hanging aroundn the reef on the chance that we might get to see Manta Rays. YES! We suit up and are in the water pretty quickly. We descend to aroumd 90 feet. We see lots of the usual suspects, but no mantas. There is a huge Napoleon Wrasse at the beginning of the dive. We hang out and dig around the corals for awhile and then we hear the unmistakeable sounds of dolphins - high pitched whines, clicks and squeaks. We all swim out from the reef a bit and try to locate them. No such luck. During the safety stop at 15 feet I am a tiny bit unerved when I spy a sea snake heading up to the surface for a breath of air. I do NOT want to see him when I get to the top! Out of the water and time for breakfast. We enjoy french toast, bacon, eggs, ham etc. Some folks enjoy the beans. . . Rich has what he thinks is a strawberry yogurt. It turns out to be a Bean and Corn yogurt! He says it tastes like someone scraped their plate into a yogurt container. . .
We sit around with Kim after breakfast swapping stories. He has lots to tell and entertains us with stories of past customers (even though he says it is not good to talk about his past clients. . .). 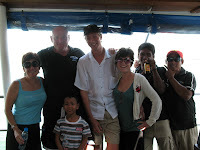 He tells us that he really has enjoyed diving with us and that we are a "class act." I am sure they get some real winners (and whiners) on the boat. 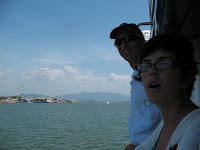 We feel lucky to have gotten Kim as our guide. 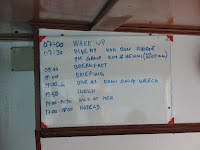 We get instructions for what to do when the dive is finished - we have to pack up all our stuff and get ready to leave. We listen reluctantly. Last dive. We are going to dive the Boon Sung wreck. 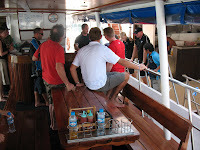 I am not really into wreck diving and we are told the visibility will not be very good. They dive this wreck because there is a large variety of fish life. Oh well - let's do it anyway. We jump in the water and descend into pea soup viz. The wreck is no great shakes, but there are tons of fish. After a while we start to get a little bored with the small dive site. Then we turn a corner and spot our first Honeycomb Eel. Beautiful. We soon find another and all of a sudden we have about 6-7 freeswimming eels (they usually stay in holes with only their heads poking out). This is really unusual and we are mezmerized. Way cool! On our ascent there are huge clouds of small fish that we swim through. It is a good capper to our diving vacation. 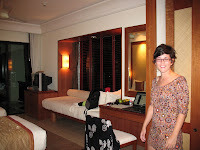 We head to our rooms to begin packing up and getting ready to leave. The boat will be at the pier in 1/2 hour. Everyone starts snapping photos of each other and saying goodbye. When we finally pull up at the pier it seems as if another dive boat (the Pawara) has taken our spot and has engine troubles. It cannot move. Uh oh. We will have to pull up beside her and climb through her to get off our boat onto the pier. The captain is quite skillful and pulls right beside the Pawara to within inchies of her side without touching her. 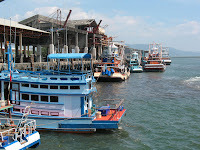 I have pre-arranged via internet to have a van meet us at the pier in order to drive us the 5 hours south to Koh Lanta (our last destination before returning to Bangkok). I have wondered for the last couple of days if there will actually be a vehicle waiting for us or if we will be stranded. 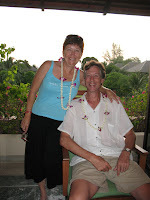 No worry - there is a huge van with a sign saying "Linda Torkington - Koh Lanta." What was I thinking? Just that quickly, we board the van and are off to Lanta. The scenery is stunning along the way. There are large palm tree plantations (? 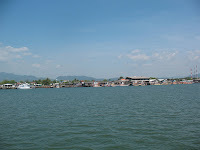 ), rubber tree orchards, tiny villages and shops, and lots of limestone mountains out our windows. 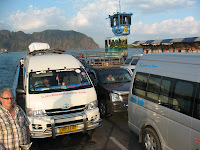 After about 2 1/2 hours we get in line to take the car ferry to Koh Lanta Noi. It is a beautiful 20 minute ride at almost sunset. A short ride and one more car ferry and we are on Koh Lanta - our home island for the next week. Our driver tells us it is only a 10-minute drive to Layana - our resort. Since this is our last week travelling (and then 2 more days in Bangkok), I decided to splash out on a gorgeous seaside resort in Koh Lanta. After all - this vacation has been soooo hectic and we really need to relax. 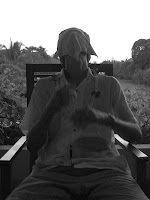 . . After searching for weeks on the internet, I decided that Layana would be the perfect choice to wind up our holiday. It is a smallish, intimate beautiful resort that does not allow children under 12. I immediately think of Janet (you would LOVE it, Janet!!). We already know this is an awesome place. It is so quiet, beautiful and unpretentious. Every where we turn we are greeted with a genuine smile and "Sawadee Ka." We are shown to our room and feel a sense of calm immediately. It is huge with a grand "garden" bathroom - tub/shower looking out into a garden. We have a back porch overlooking perfectly manicured lawn and palm/fruit trees. Our beds look serene and the a/c works great!! Plenty of room for her antics. . .
We quickly take note that Happy Hour is going on right now and we don't want to miss it. However, Janel and I feel an urgent need to book our spa appointments for tomorrow at the "Linger Longer" Spa. So - we run to book our appointments and then meet up with Rich at the pool bar for Happy Hour. We all order tropical, fruity-type drinks and take them right up to poolside. The pool is a gorgeous negative-edge pool that appears to head right out into the ocean. We slip in and enjoy our drinks while floating around. We are the only ones in the pool. Great! It is getting on to dinnertime and since we have chosen to eat late-ish (8:00) we see that we can have our choice of tables. 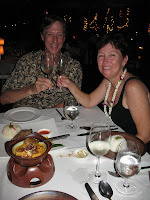 We head back to the room to change and then wander to the restaurant (open-air on the beach). They show us to a table at the edge of the sand - perfect. 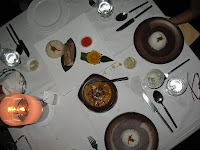 The menu is extensive and we decide to order a few dishes to share: Deep fried soft shell crab, Spicy Pomelo salad(Yam Som O), massaman curry and the special of the night - roasted snapper. The crab is yummy, but it is the Yam Som O that steals the show. Pomelo is sort of like a grapefruit, but not nearly as tart or acidic. This salad is spicy and delicious. The curry comes in a great earthenware pot and the fish is plated beautifully. We certainly feel very lucky to be right here. We have absolutely no plans for this week and are counting on doing a lot of straight chillin'. Looks promising. After dinner we walk back to our room to retire for the night. In Thai tradition, we have left our shoes outside our door. 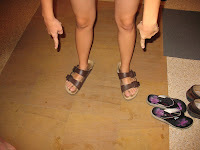 Janel spies the big Birkenstock's that are outside our nearest neighbor's door and promptly puts them on. Some things never change. . . We are very happy to be traveling together. Do these make my feet look big?? ?